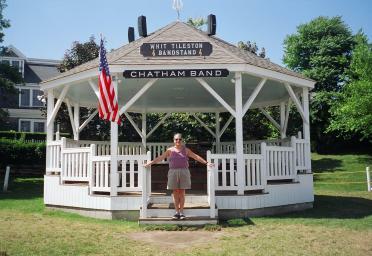 On our visit to Cape Cod, Massachusetts, it is highly recommended that I review the Chatham Band, which plays every Friday night in Chatham, MA. This recommendation comes from Tony Yadouga, a well-respected musician friend, who vacations on the Cape frequently. Following his suggestion, I travel to Chatham on Thursday to scope out the venue and get more detailed information. I am assured by many people of the popularity of this weekly event and that I should arrive very early on Friday to reserve a space for Kathy and I.
I travel to Chatham very early on Friday morning and put down my blanket about 9:35 A.M. with all the other early bird concertgoers. 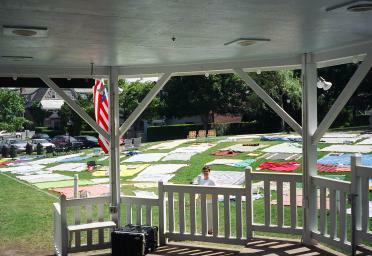 A few of the town’s groundskeepers complain about our early setups, but everyone holds their ground. These concerts have been held right here since the early 1940s. I meet a young mother Pattie, with her family, who has been coming here since she was a little girl. I meet Bill, with several children, who is reserving space for three families and has blankets placed all around mine. These blankets can remain here, safe and sound, all day long. I walk over to the Mayflower Shop to get a newspaper, writing pads and a large Chatham canvas bag to carry all our belongings in. All the people have now left and all the blankets are spread out all over the field and will remain untouched for the entire day. Kathy and I have a great day on Cape Cod, returning to Chatham in the early afternoon. 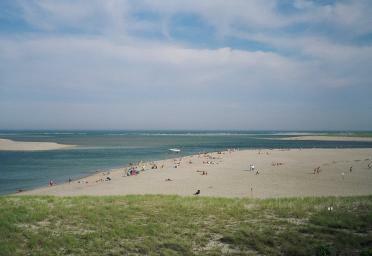 We lunch at the Impudent Oyster and walk down to the Chatham lighthouse and very scenic beach. Chatham is just gorgeous! Kathy and I return to Kate Gould Park at 6:22 P.M. We greet Pattie, Jay and Nadia. The audience is returning to the field to reclaim their blanket covered spaces. The shadows are growing and the cool breeze is very welcome. Bill and his extended family surround us on three blankets, taking family pictures with all the kids. 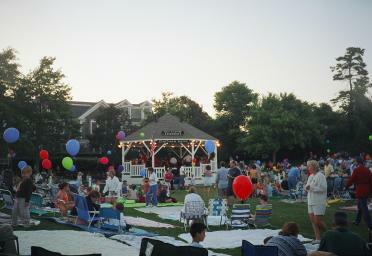 Between 7-8 P.M. the band members arrive one-by-one and families gather as cameras roll and balloons abound. The mood is very festive as children run all around. 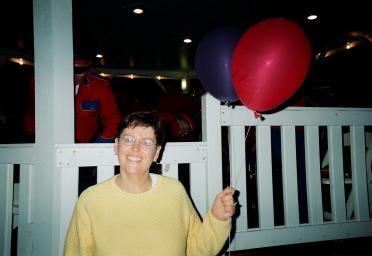 Kathy gets balloons to attach to our chairs as the field has become crowded with enthusiastic patrons. 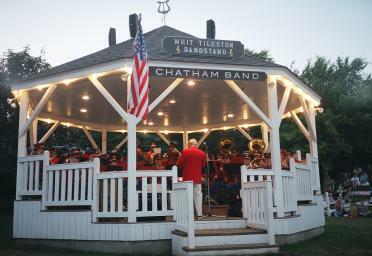 At 8:00 P.M. the Chatham Band Concert #6 begins. The bandleader, George Goodspeed, pays tribute to Whit Tileston, who conducted this musical event for 45 years. 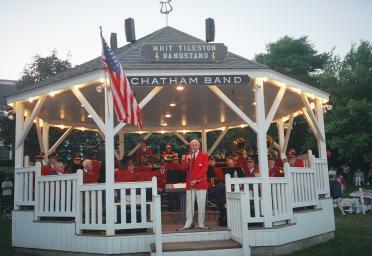 It’s band time in Chatham! The band begins with a 4/4-time march. A John Phillips Sousa composition, “El Capitan,” is next. The next musical segment is songs from Rogers & Hammerstein’s Carousel. The band displays excellent dynamic control by transitioning to a slow and serene number, showcasing a beautiful band chart and nice blend in the horn section. The next music is a Hollywood tribute. It is bright and cheerful, airy and upbeat. The clarinets and flutes play joyful, happy and uplifting musical sounds. The next music is for the kids' dance. All the children come on down to dance around the bandstand to, “Running To The Round House Nellie.” They march clockwise and then counter-clockwise. The entire band stands and sings a cappella, “Battle Hymn Of The Republic.” “The Sound Of Music” follows which is a beautiful band chart, both slow and sincere. The horns convey nice musical colors and the sound is very delicate, constrained and thoughtful. “Doe-A-Deer” is next followed by, “My Favorite Things.” The tubas ring out and the bass drums boom! The momentum carries on with more show tunes, “Climb Every Mountain” and “ Edelweiss,” from The Sound of Music. The bandleader introduces the waltz set. He eloquently states: “When I get too old to dream, everyone come on down to dance.” Parents instruct children how to waltz during, “You Can’t Be True Dear.” The band proceeds slowly and carefully. They play a Latin number, “Vio con Dios.” Then the band plays, “Deep River Rhapsody,” which is slow and meaningful, melancholy and sentimental. 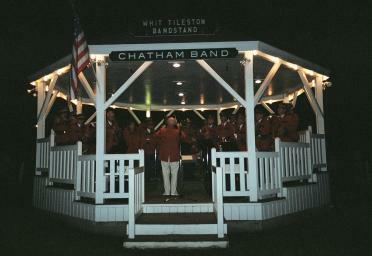 The Chatham Band puts on an inspiring presentation here tonight. Kathy and I are so very lucky to be present to bear witness to a true piece of Americana! The spirit of the music and the genuine enthusiasm of all the people; brings joy to our hearts. This is good time, clean family fun. I urge anyone even somewhat close to Chatham, Massachusetts in the summertime to make an extra effort to attend this incredible show, held each and every Friday night during the summer. This is a must see and not to be missed.